How to install OpenCart on Linux localhost? OpenCart is an effective eCommerce platform. Being a free open source eCommerce platform, OpenCart has attracted a large number of websites to make it their preferred choice. OpenCart has been supporting a wide range of eCommerce websites across the length and breadth of the global market. 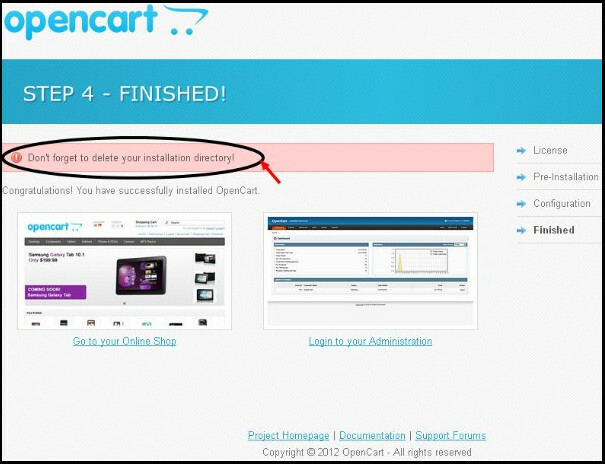 We will here look at the process of installation of OpenCart (version 1.5.5.1) on your Linux localhost. 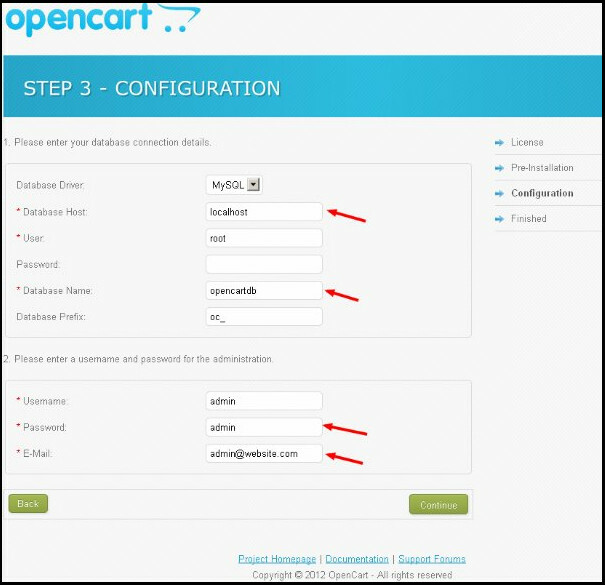 Now we will have a look at the step by step process of installation of OpenCart on your Linux localhost. Download the file and unzip the folder. The first thing you need to do is to download the zip file of the latest version of OpenCart (here we are discussing in respect to version 1.5.5.1, but you are recommended to opt for the latest version) from the official website. After downloading the zip file unzip it using suitable unzipping software. After downloading you will get 3 file structures. a. Upload folder: Contains all files required to install OpenCart on the web server. 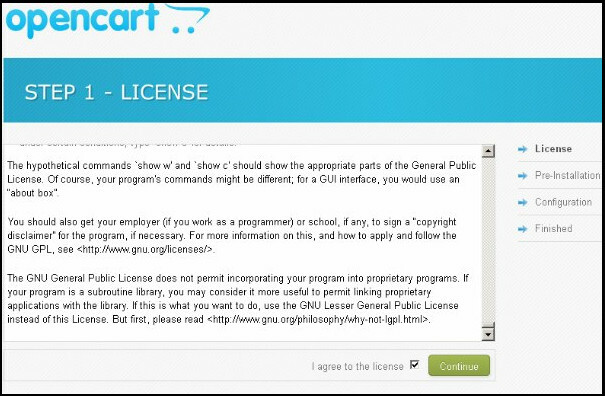 b. License.txt file: Containing license agreement regarding use of OpenCart. c. Readme.text file: Providing links to current install and upgrade instruction. You can extract these files to the desired location on your computer. After uploading the content this box will appear. 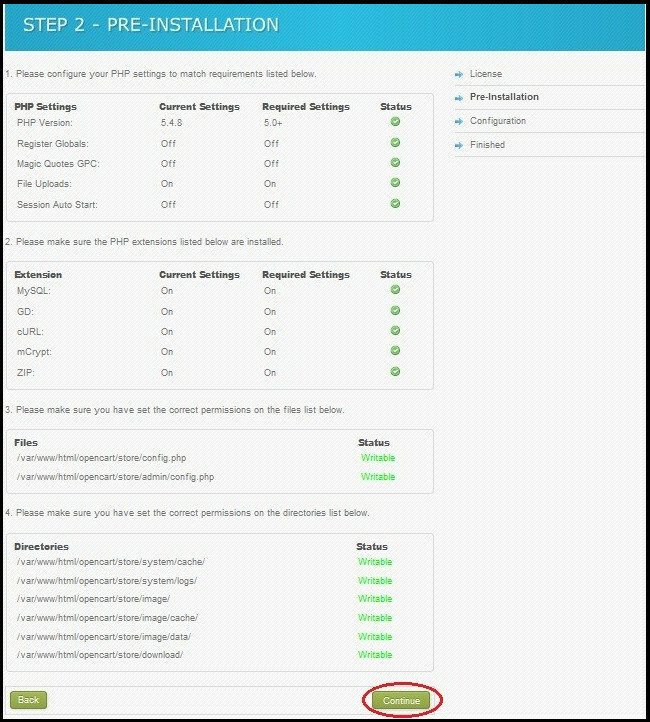 Now upload the entire content of Upload folder on to your localhost folder( XAMP, WAMP, etc.). After this, you can start installation process by accessing http://localhost/OpenCart and checking I agree license. Click on the continue button to carry on the process. The OpenCart will confirm for the requirements necessary for installation. OpenCart will now look for the requirements and at the end of the check test will highlight the things which is missing. You need to figure out those things and reconfigure. Next, you have to create a database on MySQL server to store shop’s data. Now, you need to fill the database details and admin credentials in your OpenCart installation set-up. At the end of the process a dialog box will appear. After filling in the above-mentioned details your process terminates. At the end of your data filling process, you would have successfully installed the OpenCart platform on your Linux localhost. Installation of OpenCart on your Linux localhost is not a challenging process. You can complete the entire procedure within a span of 5 to 10 minutes. All you need to do is simply follow the above step. After the installation you can use the platform effectively to design an efficient website for your business.